This branch is located at the Axis Entertainment Center on Escario Street in Cebu City. At just 100 square meters, it’s a small space, but can seat up to 60 guests, including outdoor tables. The look is starkly black and white, with touches of locally sourced and manufactured farm-raised mahogany wood tables and accessories. We have areas with machuca tiles, and walls and ceilings are a matte black. It looks very different from anything we have done before, and it goes back to a favorite personal preferred pairing of black and white. We have a retail table at the entrance, to feature bits and bobs and emphasize the trading nature of the relationship with the Europeans, and we currently have some excellent dry pasta, canned goods, oil and vinegar cruets, cast iron pans, etc. on offer. Several months ago, we snuck off to China to purchase some of the furnishings, glassware, cutlery, etc. for this and other branches. I didn’t write about that trip, but boy, was that a TRIP! I particularly like these cast iron pans, which we are selling at a fraction of what branded ones go for, and I suspect they will sell out quickly. 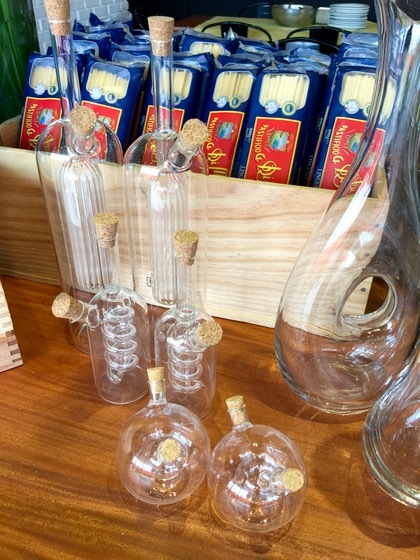 These oil and vinegar cruets were mostly for use on our own tables, but we put a few on the retail table anyway. Notice the water pitchers to the side, which look very similar to a Crate & Barrel version, but these ones cost significantly less. 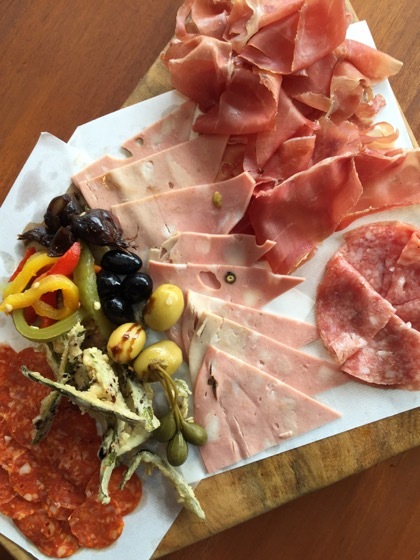 We have antipasti planks (yes, inspired by Jamie Oliver’s planks) served on molave planks that we made ourselves from a fallen tree that I bought from the neighbors at our office in Cebu. 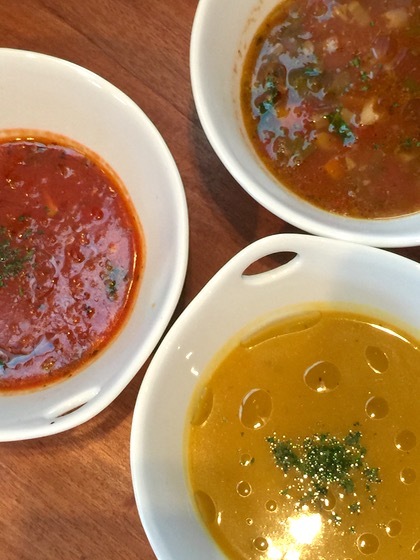 We have a few hearty soups like a roasted tomato, squash and minestrone. 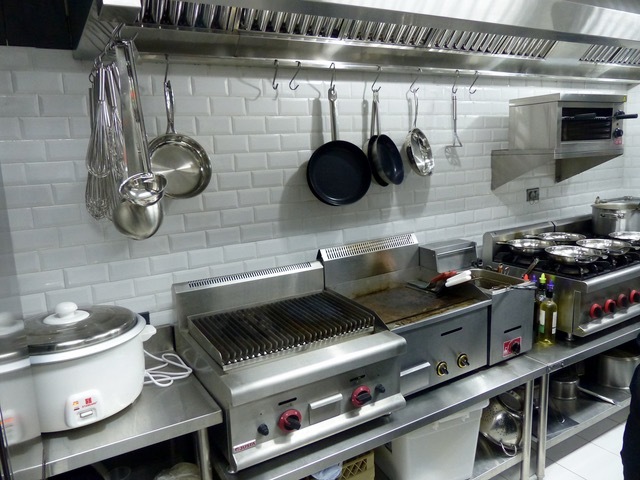 Our eager kitchen team is led by an Executive Chef Jason Feeney who has really organized the kitchen professionally. I had some input on dishes, but this is mostly his show. And this branch boasts the snazziest kitchen we have ever assembled. Note the subway tiles, gleaming equipment, compact but complete set-up. If the restaurant fails, I will transfer the entire set-up to our house. :) And yup, I asked the question too, “what’s that? a rice cooker?” but it’s for staff meals. 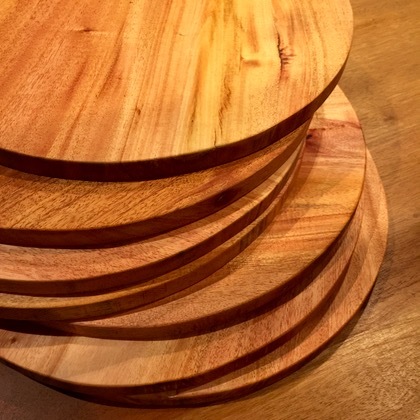 We custom designed these mahogany pizza plates that I really LOVE, LOVE, LOVE and will probably make more and sell them as well. 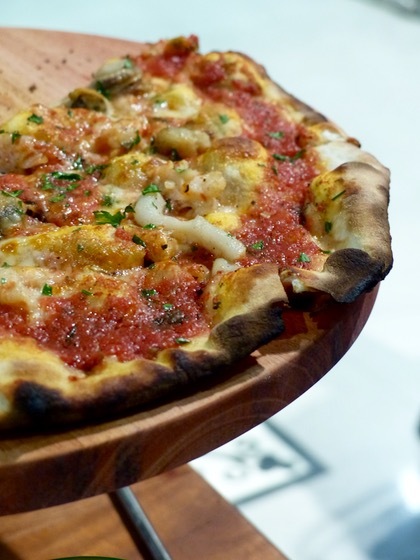 …a seafood pizza… and I forgot to take photos of the pasta! 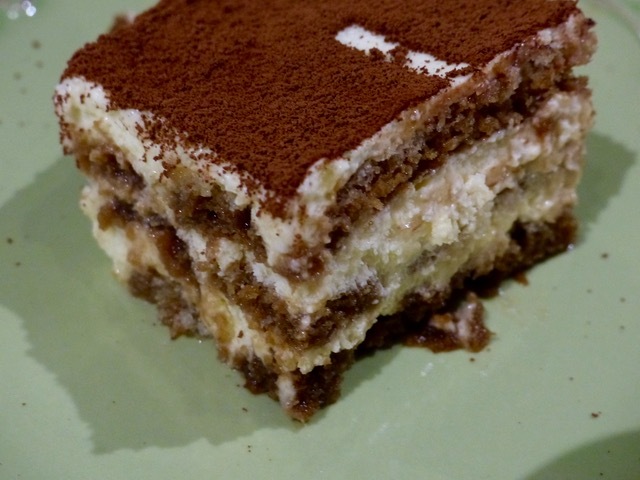 And a pretty darned good tiramisu to end your meal. Oh, I nearly forgot. 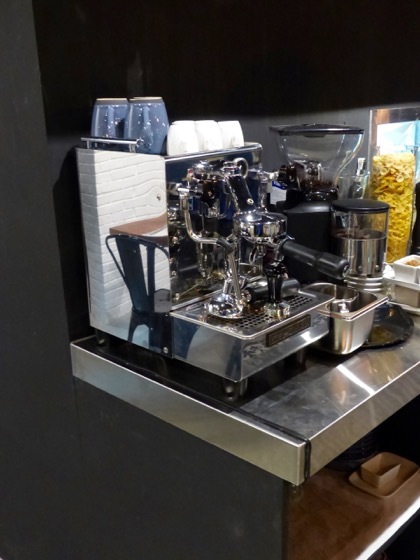 For the coffee addicts, we have a small but proper coffee machine, and our newly minted baristas can get you an espresso, cappuccino, americano or whatever you please. And yes, we use Italian coffee. Soft opening starting this Saturday, October 17, 2015. We will not officially announce the opening until later in the month. Now I can get some much needed sleep. Oh I am so lucky to live nearby…and cannot wait MM to visit your newest venture, will be eagerly awaiting for your grand opening! Congratulations on your new venture MM! Maybe you can post the menu here so that we can see what’s on offer? Woohoo! Congrats!!! I won’t be dropping by soon as I am so far away, but I’m sure it’s gonna be a hit. Congratulations on your latest addition to your expanding restaurant empire. I’ll be in the Philippines next year and I hope to make it to Cebu to taste some of the delightful Zubuchon that I’d been reading about for years. In the mean time, I’ll continue to quietly follow your delightful blog as I have been for many years. Wow!! Something to plan into my Cebu visit next year. Love the subway tile too. Congrats on your new baby, MM! congratulations and best of luck, MM and family and Crew! am salivating over that kitchen. Good luck in your new venture which I am sure will be a success with the kind of diligence, research and detailed attention you put on any new endeavor. All the best on your new restaurant MM! 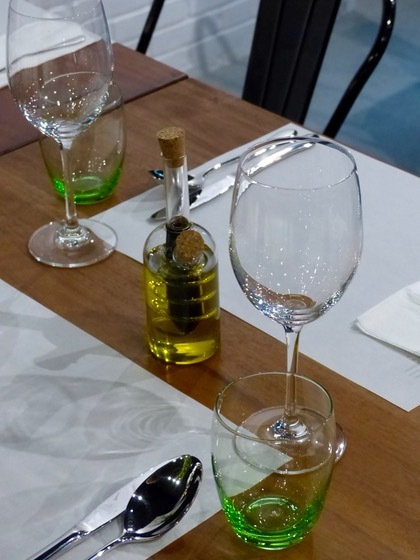 We can’t wait for try this restaurant MM! Another Cebu stop during Sinulog. I can’t wait! Those cast-iron pots and water pitchers are coming home with meeeeeehhh! Wishing you all the best, MM! 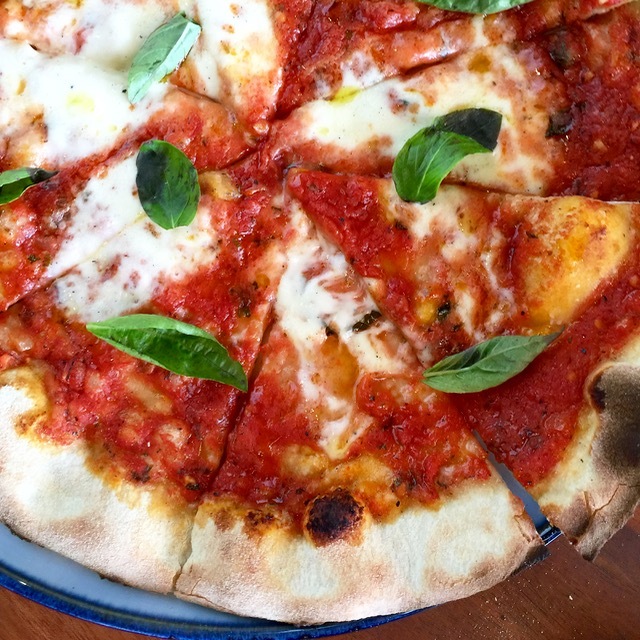 Love the look of those pizza plates, I want one or two or……..
Wow! Will be in Cebu on Nov 22-28 and frozen Zubochon is on my list of pasalubongs???? how heavy are those cast iron pans? So I can buy additional baggage allowance…. Congratulations MM! How did you get your pizza plates so thin? I have a few planks of Mahogany and Teak that I would like to slice thinner, in order to make them lighter and to multiply them. bos marketman, congratulations and more power. may pics ba noong wood fired oven?? Before reading the entire post beyond the heading, I thought the restaurant would still be porcine-centered in some way. Ha! CONGRATS! Out of curiosity, how long was this in the planning + purchasing + setting up? (actually Venetian), an accurate detail since they were indeed just a passel of warring states at that time and won’t be united as Italy until 1861 with Venice itself joining ten years later. The most memorable capsulation of this chaotic period comes from the movie The Third Man, “You know what the fellow said – in Italy, for thirty years under the Borgias, they had warfare, terror, murder and bloodshed, but they produced Michelangelo, Leonardo da Vinci and the Renaissance. In Switzerland, they had brotherly love, they had five hundred years of democracy and peace – and what did that produce? The cuckoo clock.” Btw, the Borgias hailed from Valencia, same as the better oranges. Congratulations and good luck!!! Really elegant interiors. Nice name link to Zubuchon too. Did the preparations make you miss the deadline for submission of COC for President?! Congratulations and best wishes for great success!!! The half-Italians in your family applaud and cheer you on. It really looks super — venue and food alike. Can’t wait to personally check it out. Good luck! 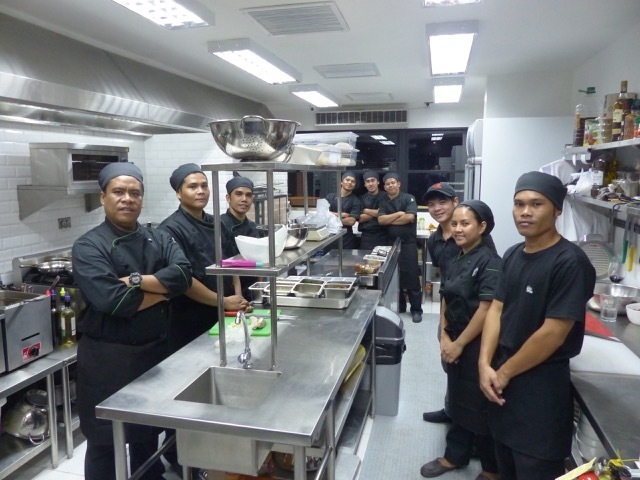 Congratulations MM – -Wow na Wow ang kitchen! Congratulations and best wishes on your new place! Congrats! Can’t wait to visit..
Footloose, the cuckoo clock didn’t originate in Switzerland either. It came from the Black Forest region of Gemany. Congratulations! From a blog to this. It has been quite a journey. I am predicting this is just the beginning and Cebu will be a major foodie destination, thanks to you. Thanks Ami. Not my interest, cuckoos and clocks, just quoting Graham Green who wrote the screen play and subsequently the novella based on it. Notice too that Italy has never been under the Borgias as I explained although the Borgias did hold the papacy on two occasions in which time not only were cardinal’s hats openly sold but oftentimes fraudulently promised to several buyers. One extremely rich buyer was able to hide his hoard in a desert island in the Mediterranean before being poisoned by Cesare. His confidant discovers the treasure map written in invisible ink as he was igniting it as kindling but got thrown into prison where incidentally, the young political prisoner Edmond Dantès would be held in an adjacent cell. The rest, of course, is one of the sweetest revenge/adventure of all time, The Count of Monte Cristo. There MUST be porchetta on the menu. 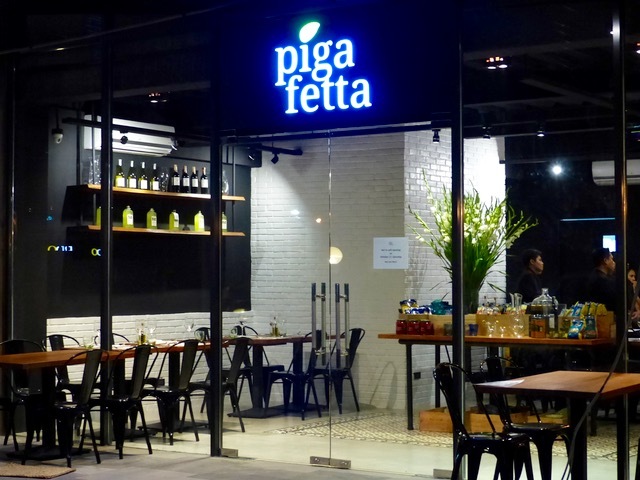 With a name like Pigafetta…. 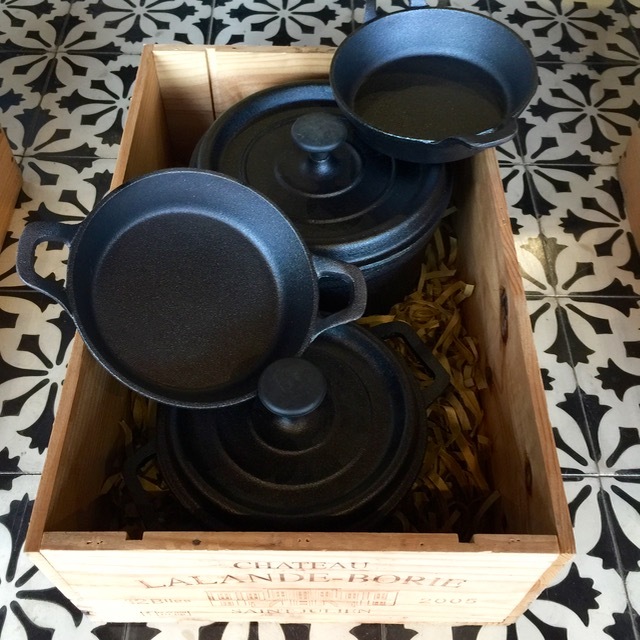 hi marketman, greetings from davao… is it possible to buy a couple of cast iron pans like the one in the pictures? i would love to have those for my tiny kitchen. squash soup….also, Kamias juice is really refreshing! Ron, thanks for stopping by, perhaps on your next visit home then. :) fried neurons, exactly, that’s what I thought when I saw them, and at a tiny fraction of the price, I figured if no one else saw the value, I would end up with a few in our home, not a bad outcome… Oni, they are only for sale in Cebu, but perhaps if you have a friend there, they can purchase it for you? myra, actually, we steered clear of porchetta on this one, but I did personally make the pancetta, the cured salmon, and I now have some bottled tuna cooling in our kitchen for future Pigafetta experiments. I took the finest tuna loin I could buy, and in this case, bottled them and processed in a pressure cooker to ensure they are cootie-less. Ross-Anna and Greens & blossoms, thanks! 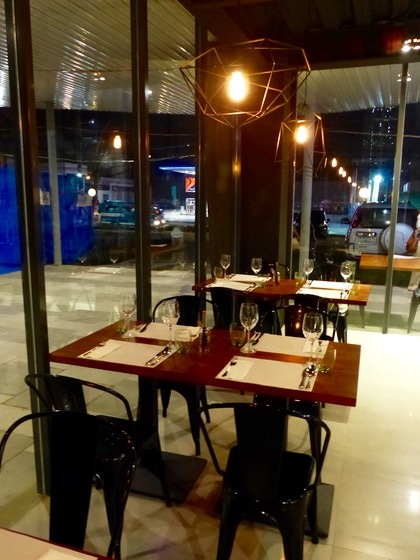 Cwid, the dining landscape in Cebu has definitely gotten better in the past 10 years. 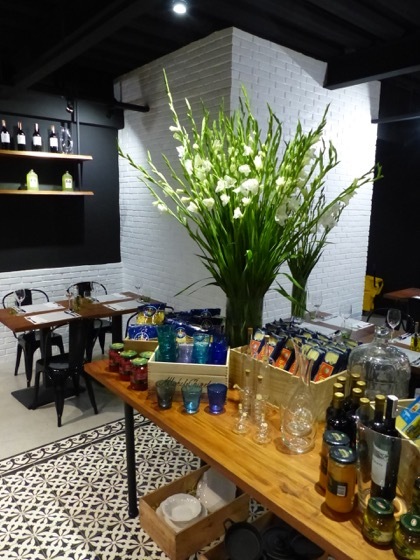 The Abaca group, along with several other independent restaurant owners have been upping the ante. It’s nowhere are chi-chi as Manila is now, but it’s improved tremendously. Congratulations! Another feather in your cap. Would love to visit Cebu for this. Congratulations, Marketman, family and crew! Looking forward to eating there- soon, I hope. Btw, it’s chrisb, not chrism. Autocorrect. Congratulations, and I hope all goes well for your opening! congratulations! Love the the new Resto name ! Reading this post (including many of resourceful and witty posts) and your replies to MM community reminded me of a character in Kitchen Confidential…’Bigfoot’. those cast iron pots &pans are looking good! Congratulations, MM! What a clever choice of name! Wishing you all the best on this new venture. Congrats on your new baby, MM!! Definitely a winner like Zubuchon! Congratulations and more success in future endeavors! i’ll surely try this and Zubuchon the next chance i go to Cebu. congratulations mm! Hoping for continued success in your new endeavors! Congratulations MM! Looking forward to eating at this new place. And, yes, have to have one of those cast iron pan. Congratulations in this new venture! I love the cast iron pans and crystals! MM, that looks like a really good pizza! beautiful space MM! i will definitely visit when in Cebu. Congratulations! you could actually put up that kitchen set up for auction and people would bid for it … :) but for sure you will never need to. this looks and sounds like a hit! Congratulations to you and the Mrs. on your new undertaking. The resto looks awesome! Have to schedule a visit soon. By any chance, do you allow arts and crafts workshops to be held in your resto? Hi we just want to offer our different kinds of Fresh Mushroom we are located at Mandaue city for inquiry please call or text at 09228537602/09178475354. congratulations MM! so happy for you. congrats!!! French cuisine or Mediterranean on next venture? I’ve been there and we’ll be going back again soon! 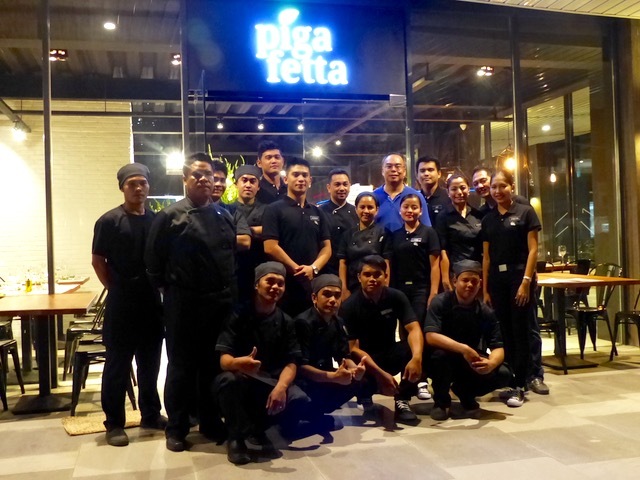 One of the best Italian restos in Cebu! Congratulations, Marketman and crew! 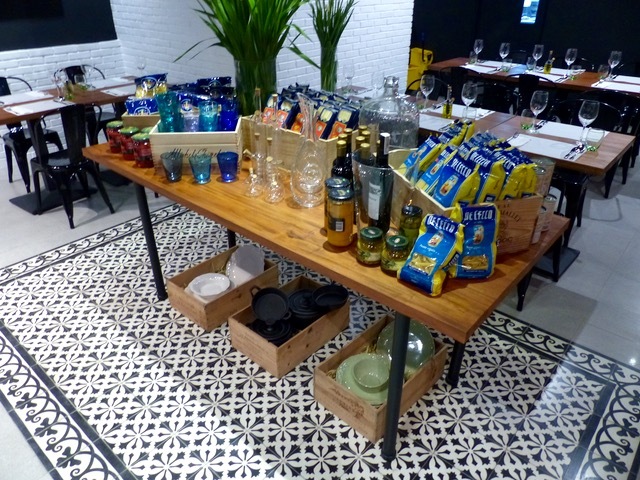 I really like your mini “Sur La Table” display. LOVE the cruets! Sorry this is late but congrats and best wishes on your beautiful new Italian bistro venture, MM! Im wonder if u are open and still sell iron pan for frying. If you do,how much a 26 cm fryingpan will cost. If so i will take a trip,eat and look at what you sell. Best regards. Sigurd Overaa, Talisay.